Free Mall Scavenger Hunt List for the Information Mall Scavenger Hunt. Instead of hunting for items the players hunt for information about the mall. 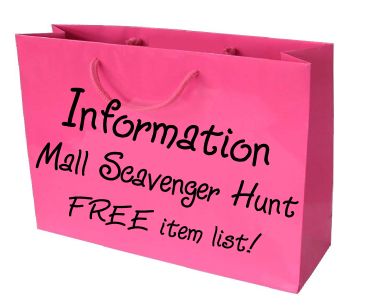 There is no cost to play this scavenger / treasure hunt at the mall. A trip to the mall before the Scavenger Hunt is needed to find the correct answers to the questions. Keep a key of the answers to score the teams answers at the end of the scavenger hunt. Great birthday party activity for girls and boys, kids, tweens and teens ages 8, 9, 10, 11, 12, 13, 14, 15, 16, 17 years old. 5 points for each correct answer. 10 point deduction for every instance of running, screaming or being rude to salespeople or shoppers. 1. How many booths are in the Food Court? 2. How many restaurants are in the Mall? 3. How many buttons does the elevator have? 4. How many elevators in the whole mall? 5. How many stairs are there in the main mall stairway? 6. How many stores are in the mall? 7. How many stores sell children's shoes? 8. How many benches are on the second story? 9. Which direction does the Main Mall entrance face? 10. How many bathroom stalls are in the ladies restroom on the first floor? 11. How many stores have the letter "Y" in their name? 10 point bonus for the most bags from these stores. 12. How many mannequins are in front windows of stores on the second floor? 13. How many bathrooms does Penney's have? 14. How many gumball machines sell red gumballs? 15. How many store have moving displays in their front windows? 16. How many trees in inside the mall? 17. What 2 stores are on either side of Macy’s upstairs? 18. How many dressing rooms at the gap? 19. How many entrances to the mall? 20. How many mall entrances face east? 21. Store with the largest store number on the information map? 22. How much does it cost to rent a stroller? 23. How many green video controllers at Game Stop? 25. How many styles of blue shoes at Foot Locker? 26. How many dessert items on the ___________ restaurants menu? 27. How many Kiosks on the first floor? 28. How many monopoly games in the toy store? 29. How many stores have 50% off sales signs in their windows? 30. How many stores with blue in their store sign? 31. How many jars of candy in the candy store? 32. How many vending machines in the mall? 33. How many trashcans on the 2nd floor? 34. How many sizes of gumballs in the candy store? 35. How many seconds does it take for the escalator to get to the second floor? 36. Why was the mall named what it is? 37. What year was the mall built? 38. How many high chairs does the food court have? 39. How many stores have orange and lime green in their display windows? 40. How many stores give free samples? - 10 point bonus for bringing the most samples to the meeting place.